While inverse vol funds were the immediate catalyst for the February 5 market crash, the market's recent jittery behavior has coincided, and often been blamed on, the recent uptick in inflation. That said, as Deutsche Bank's Binky Chadha writes, whether this was cause and effect is debatable. Nonetheless, late in the business cycle with a tight labor market, "strong coordinated growth", a lower dollar, higher oil prices and a fading of one off factors, all point to inflation moving up. As a result, two key questions have emerged: What does higher inflation mean for equities? And how long until higher inflation translates into a recession. Here, Deutsche Bank makes some preliminary observations. First, and conceptually, higher inflation is ambiguous. From a pricing vs cost perspective, whether higher inflation leads to higher or lower margins depends on the relative strengths of price vs wage and other input cost inflation. It depends on the relative importance of variable vs fixed costs. And on the extent to which corporates can increase productivity in response to cost pressures. 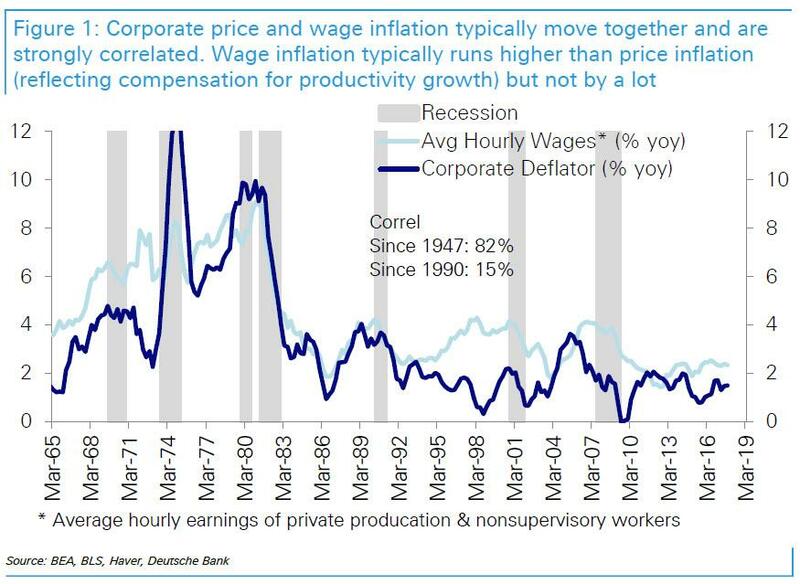 It is notable that while markets seem to have been surprised by the recent uptick in wage inflation, corporates have been noting it for at least a year. Finally, inflation does not occur in a vacuum. The drivers of higher inflation matter and when it reflects strong growth, it implies not only higher sales but operating leverage from fixed costs can raise margins and amplify the impact on earnings. In other words, inflation in itself is not a death sentence to bull markets. What is just as important is overall economic growth (rising inflation is benign if overall economic growth is higher), as well as the impact of inflation on profit margins - i.e. the ability to pass inflation through to the end consumer - and most importantly, how the Fed reacts to inflation, or namely does the Fed think it is behind the curve. Ultimately, it all boils down to whether future inflation will be higher (or much higher) than currently. Nov 1, 2017: "…the Committee is monitoring inflation developments closely"
Dec 13, 2017: "…the Committee is monitoring inflation developments closely." Jan 31, 2018: "The Committee will carefully monitor actual and expected inflation developments relative to its symmetric inflation goal." Making matters worse, while the Fed has raised rates 4 times since Sept. 2016, increasing the discount rate by 1.00%, the 2Y Tsy has increased by 1.70% over the same period, suggesting that bond vigilantes see the Fed as behind the curve, literally. Furthermore, as Investec points out in a recent note, although both headline and core inflation appear tame – a key leading indicator from the New York Fed, the Underlying Inflation Gauge (UIG), is pointing towards increased risks ahead, having hit 3.00% in January, up from 2.94% in December and the highest level since 2007. Furthermore, as Investec adds, the UIG has proven especially useful in detecting turning points in inflation trends, and has shown high forecast accuracy when compared with core inflation measures. 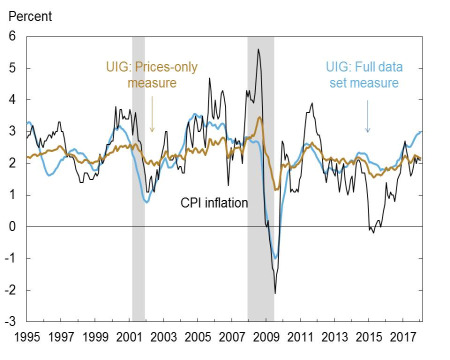 As shown in the chart below, the UIG has been indicating far higher levels of inflationary pressure relative to Core CPI since over the past year. The divergence between the core CPI and UIG is notable, and reached a differential in excess of 1% in recent months. Based on historical patterns, such a wide divergence has been followed by increasing pressures in official inflation statistics, prompting the Federal Reserve to become more aggressive in their actions. And while one can argue whether higher inflation is bad, one thing is guaranteed: rising interest rates are the nemesis of an aging bull market. Nothing has killed more bull markets than a deteriorating monetary climate with a relentless uptrend in interest rates; in fact, as we have shown previously, virtually every single Fed tightening cycle has always ended with a recession or some "event." Once started down the track of tightening, the conclusion seems all but inevitable. Out of 11 past tightening cycles, nine have resulted in a recession while only two created a soft landing that allowed the Fed to ease and avoid a recession. Here another observation from the historical record: the Fed has a dismal track record of slowing the economy and at the same time avoiding a full blown recession. As investec ominously points out, "while each cycle has its own unique characteristics, the odds are not favorable that the current Fed tightening cycle is going to end happily for investors." Which brings us back to the key question: how long before rising inflation results in a recession? 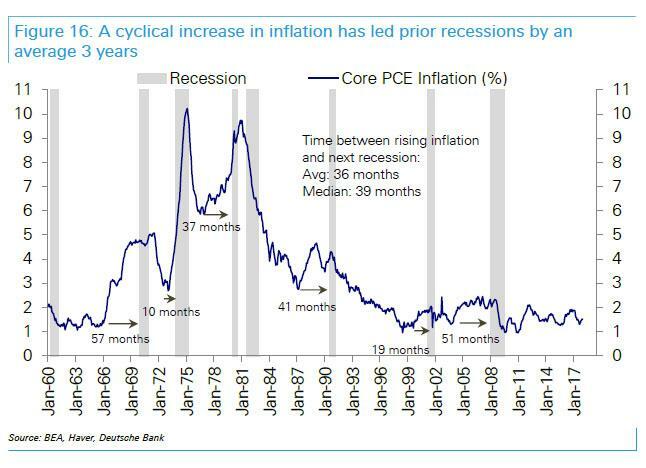 If the recent uptick marks the typical mid-to late-cycle inflection up in inflation, how long after did the next recession typically occur? On average 3 years, which would put it in late 2020. But the timing is likely determined critically by the Fed’s reaction. Historically, a Fed rate-hiking cycle preceded most recessions since World War II, with recessions occurring only after the Fed moved rates into contractionary territory. Arguably the Fed did this only after it was convinced the economy was overheating and it continued hiking until the economy slowed sufficiently or went into recession. At the current juncture, core inflation has remained below the Fed’s target of 2% for the last 10 years and several Fed officials have argued for symmetry in inflation outcomes around the target, i.e., to tolerate inflation above 2%. It is thus likely that the Fed will welcome the rise in inflation for now and simply stick to its current guidance, possibly moving it up modestly. It also means that if indeed the Fed intends on running the economy hot, equity investors may want to consider jogging quietly for the exits, especially before the vol-targeting, inverse vol, Risk parities, CTAs and the rest of the systematic funds decide to make another sprint for it.